In an effort to round out the corners in my repertoire of canned goods, I wanted to replenish our stock of canned mushrooms. This past week when I did our monthly shopping at Cash & Carry, I purchased two flats (20 lbs.) of sliced mushrooms. I processed 10 lbs. at at time, starting with simmering the mushrooms in my largest stock pot. 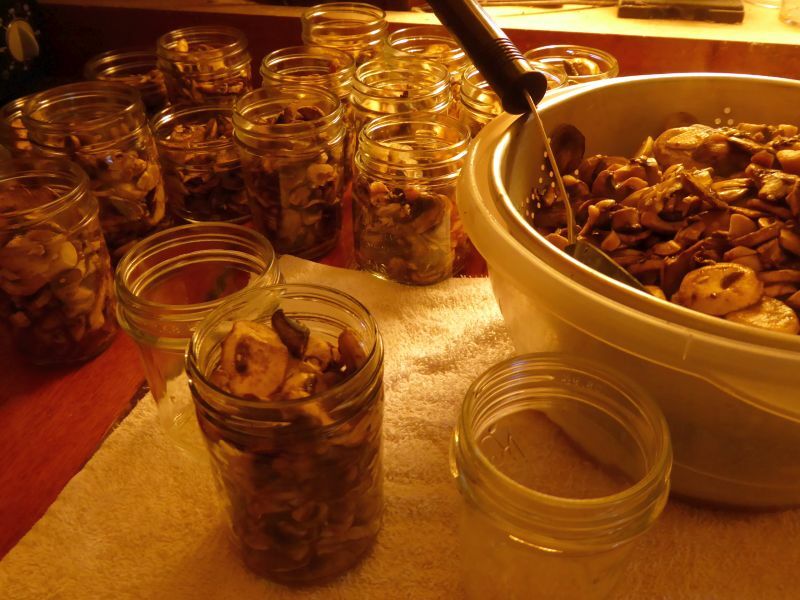 While the mushrooms were on the stove, I rounded up and washed a whole bunch of half-pint jars. In years past when canning mushrooms, I used pint jars. However since Don and I are the only ones who are fond of canned mushrooms (as complements to certain recipes, such as chicken piccata), half the pint jar of mushrooms sometimes went to waste. Half-pints are far more suited in this case. ...I scooped a bunch of mushrooms at a time into a larger colander to drain, and started filling jars. Half-pints only require a quarter-teaspoon each of salt. Topping each jar with clean boiling water. While wiping the rims, I found one jar with a large nick. Oops, it just got downgraded to non-canning purposes. I poured the contents into another jar. Believe it or not, I've never canned in half-pints before and wasn't sure how many the pressure canner would hold. Turns out, 13 fit on each rack. That's 26 jars altogether. Half-pints (as well as full pints) of mushrooms get pressure-canned at 10 lbs. pressure (12.5 lbs for our elevation) for 30 minutes. The first 10 lbs. of mushrooms gave me 28 half-pints, so I held two jars back for the next round. Next 10 lb. batch, next round of jars. Radically messy kitchen. Let's face it, canning is NOT a tidy process. Halfway done. I held back half a basket of mushrooms for fresh use, so the second batch didn't have as many half-pints, allowing me to fit the two leftover jars into the canner this time. All the hard work is done by this point (including -- ahem -- washing dishes -- hey, I needed the counter space). Final yield: 50 half-pints of mushrooms, enough to last us a good long time. Boy do I love canning. There's nothing more satisfying than seeing those rows of jars cooling on the counter. Some folks have been asking how our garden is doing, so I thought it might be time for an update. 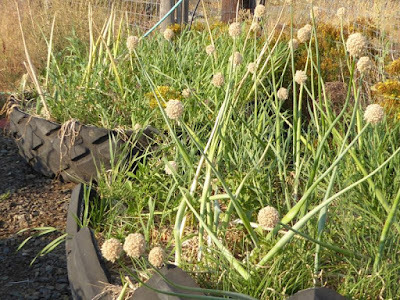 For new readers, a short recap: we garden in tires. Specifically, big honkin' tractor tires. The reason for this is, after nine years of fighting tough clay soil and massive weeds (this is before we had a tractor), we took a totally different tact for our garden. We paved over the ground with tarps and gravel, hauled in massive (free) tractor tires, and filled those tire with a combination top soil, composted manure, and sand. We set up a drip irrigation system over most of it. As a result of these frugal raised beds, we've never had better success. We didn't expand the garden much this year, even though we have the room as well as about a dozen new (old) tires ready to install, because we ran out of time last spring. The only addition we made was putting in four new blueberry tires. So here's how everything is doing. 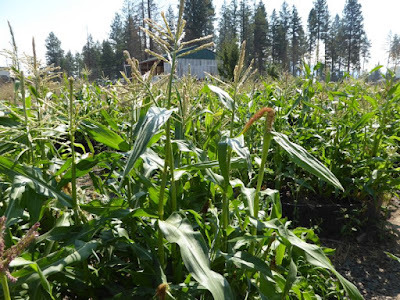 The corn, despite not getting planted until June 17, is doing splendidly. This corn is a short season dwarf variety called Yukon Chief. It took a long time to find corn that would grow in our short season windy area -- but this stuff is phenomenal. 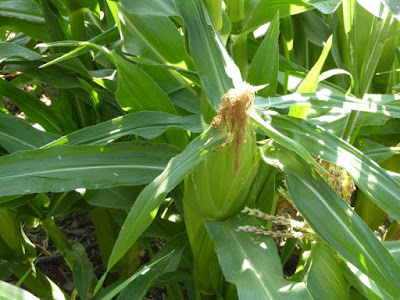 Last year we harvested about 600 ears, and I'm recommending this variety to all our neighbors (as well as handing out seed with a free hand). We estimate we'll be able to harvest in less than two weeks. 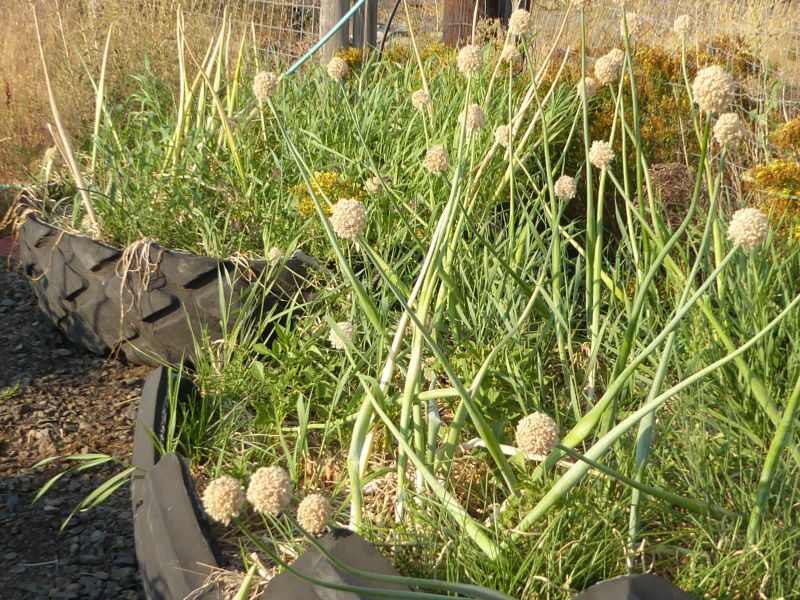 The garlic is long past ready to harvest (I've just been too busy to dig it up). Here are the strawberry beds. We got lots of strawberries this year, but unlike last year, we didn't get enough to freeze (last year we put about 60 lbs. in the freezer). Every area has their pests. 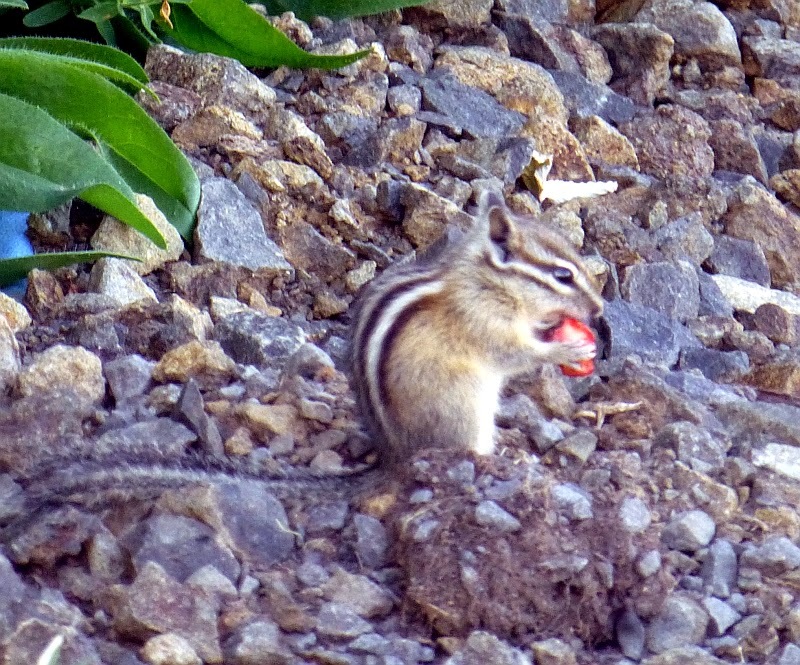 For us, it's the ubiquitous chipmunks. As cute as these guys are, they're voracious and industrious, and can carry away entire harvests if we don't do something to prevent it. Netting has a problem in that it can catch and sometimes kill animals, so I don't especially like using it. Last year we caught a couple of snakes and birds, but we were able to free them without incident. This year the robins didn't seem as inclined to eat the strawberries, so we didn't net. Big mistake. 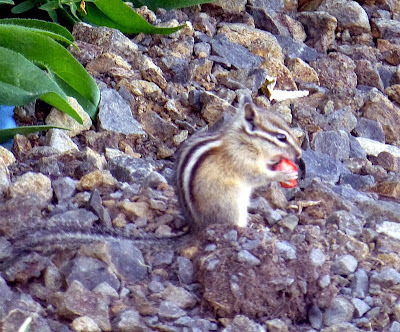 While we didn't have problems with birds, we had enormous problems with chipmunks. I realized in retrospect last year's netting did an excellent job of keeping the little rodents at bay. This year the chippies filched just about every last berry. We had plenty of fruit for fresh eating, but none at all for the freezer. Live and learn. Next year I'll net. Here are our tomato plants, lush and full. The fruit is just coming ripe, so we've been picking and temporarily storing in the fridge until I have enough to start canning sauce. We have both paste tomatoes and larger slicers. Don, who adores fresh garden-grown tomatoes more than anyone I've ever met, is in seventh heaven at the moment. We had such success with our eight tires of potatoes last year that I planted twelve tires this year. They're growing very well. These are cayenne peppers. There's nothing Younger Daughter loves more than spicy hot peppers, so she'll dry these and use them over the winter. Red bell peppers. Growing well, but not much fruit yet. We'll see what we get before the first frost hits. Raspberries. They're past their season, of course, but we got lots and lots and lots of raspberries this year. Here are some of the new blueberry bushes we planted in the spring. One brave bush even put out a handful of small berries (but very sweet! ), however mostly they've put their energy into growth. They're all healthy and strong. This is our bed of older blueberries, which produced heavily this year. Lots of new growth on these bushes, always nice to see. There's something so comforting about the steady dependability of carrots. Last year I tried letting my carrots overwinter and go to seed (they're biennials), but to my dismay after doing fine all winter they suddenly all rotted in late spring. I'll try it again this year with a few carrots (this time I'll mulch heavily) and see what happens. These are the potato onions. You might remember last fall, a reader sent me some potato onions to try after hearing my frustration in trying to grow onions from seed. In the fall I planted every last bulb he sent, mulched them over the winter, and watched as they grew strongly during the summer. I snipped the heads off some of them and left the heads on others (experimenting, of course). These are just about ready to harvest. If these onions live up to their expectation as easy and consistent to grow and being good storers, as well as having a bite to them, I doubt I'll ever grow anything else. 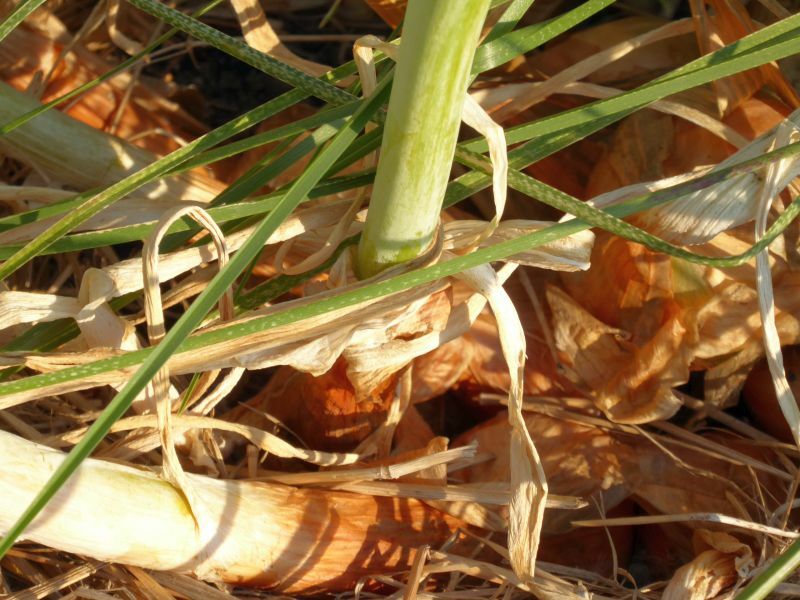 We adore onions in our family, so having a steady supply of a type that doesn't rot is a wonderful blessing. This is lettuce, going to seed. The seeds are just about ready to collect. The funny thing is, these plants were volunteers from last year. I figure if something is going to grow that vigorously and easily, it's seed worth saving. The Brussels sprouts we let overwinter for seed produced a magnificent crop of seeds (most of which were diligently harvested by the chipmunks, of course). I collected a great number of them. I learned Brussels sprouts require a much longer growing season than we get here in north Idaho, so I'll experiment and start some seeds indoors next January or February. A volunteer tomato. 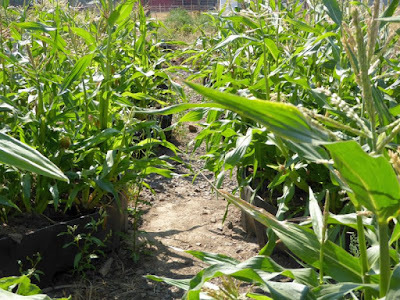 Several plants grew spontaneously from seed that dropped from last year's plants. I'll certainly be saving some seed from these plants this year. Watermelon. I only planted two tires' worth this year. I planted them late (hint: don't bother trying to start watermelons indoors, it never seems to work) so we'll see if they mature before the first frost hits. These melons are called Cream of Saskatchewan and are a Russian heirloom variety brought to Canada many years ago. It has creamy-white flesh. They're thin-rined and so don't store well, but who wants to store watermelons? The thin rinds make them split easily, so that's a drawback. But as long as they grow in our short season and are sweet, I'm satisfied. This is one of two surviving fruit trees from our original attempt at an orchard (the other tree, also a pear, is much smaller) and is producing fruit gangbusters. I'll pick these in about a month, let them ripen indoors, and can them. That's our garden update. Our garden is modest, but it does reflect a lot of hard work we've put into it in the last few years.